Will Apple Hit a New Low? After putting up an encouraging bounce back to $470 at the end of March, shares of Apple have promptly given back nearly all of those gains. The Mac maker dropped by as much as 1.5% on Friday, in part because of the disappointing jobs report that dragged down the broader market. In the final hour of trading, shares tanked for no apparent reason to as low as $419.69 -- just pennies away from tapping a fresh 52-week low. Shares promptly recovered just as quickly and inexplicably. Shares have mostly stayed range-bound for the past couple of months following the January earnings plunge, lacking any positive or negative catalysts to speak of. The most apparent positive catalyst that investors are anxiously awaiting remains the inevitable dividend boost, but all has stayed quiet on the cash front so far this year. In the past we provided a single-point estimate of guidance that was conservative, that we had reasonable confidence in achieving. This quarter and going forward we're going to provide a range of guidance that we believe that we're likely to report within. Not only will March be a tough quarter, but the June quarter may be even more challenging. There are numerous flagship smartphones launching in April, including Samsung's Galaxy S4 and HTC's One, while consumers and investors are expecting new iPhones as early as this summer. BTIG Research analyst Walter Piecyk fears that June guidance could potentially drive shares below $400, even as he recently upgraded shares to "buy" with a $540 price target and thinks the risk is worth taking. Since Apple had such a monster 2012, it's facing tough comparisons this year. 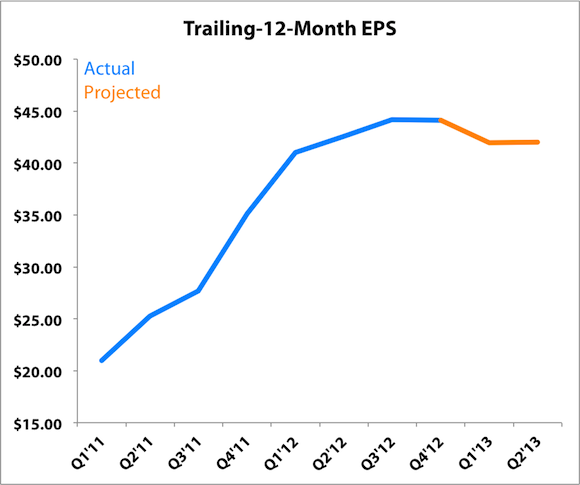 Trailing-12-month EPS is projected to decline over the next couple of quarters. Source: SEC filings and Yahoo! Finance. If Apple hits the March EPS consensus of $10.15 on the dot, it will have earned $41.95 per share over the past four quarters. That would represent negative earnings growth during the quarter (down from $12.30 EPS a year ago), which would inevitably make for some gloomy headlines. That might scare some investors, especially if they compared possible headlines of "Apple Earnings Fall 17%" with ones earlier this week of "Samsung expects first-quarter profits of $7.7B, up 53 percent." Of course, Apple will still beat Samsung in absolute dollars with closer to $9.6 billion in net income, easily topping the $7.7 billion in operating income that Samsung is expecting (Samsung's net income will be lower after taxes and other expenses). But again, investors tend to focus on the year-over-year comparisons, in which case Samsung will look better than Apple. If the net result is that Apple drops closer to $400, it would be trading at around 9.5 times earnings. That's about where it trades now, as it still fails to garner proper respect from the Street, especially when you consider that the broader S&P 500 currently trades at 17.9 times earnings. Apple will inevitably add to its cash this quarter, which will make it even cheaper relative to its earnings power. If Apple adds "only" $10 billion in cash (it added $12.6 billion in Q1 2012), it will have $147 billion in cash, or $157 per share. At $400 per share and consensus EPS, that all translates to 5.8 times earnings ex-cash. Yes, 5.8. 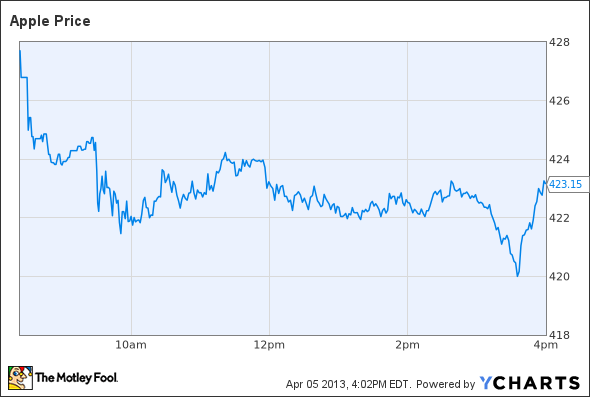 Apple may head lower, perhaps even next week, but it shouldn't. Apple's absurdly low valuation has investors wondering whether Apple remains a buy. The Motley Fool's senior technology analyst and managing bureau chief, Eric Bleeker, is prepared to fill you in on both reasons to buy and reasons to sell Apple and what opportunities are left for the company (and your portfolio) going forward. To get instant access to his latest thinking on Apple, simply click here now. The article Will Apple Hit a New Low? originally appeared on Fool.com. Fool contributor Evan Niu, CFA, owns shares of Apple. The Motley Fool recommends and owns shares of Apple. Try any of our Foolish newsletter services free for 30 days. We Fools don't all hold the same opinions, but we all believe that considering a diverse range of insights makes us better investors. The Motley Fool has a disclosure policy.